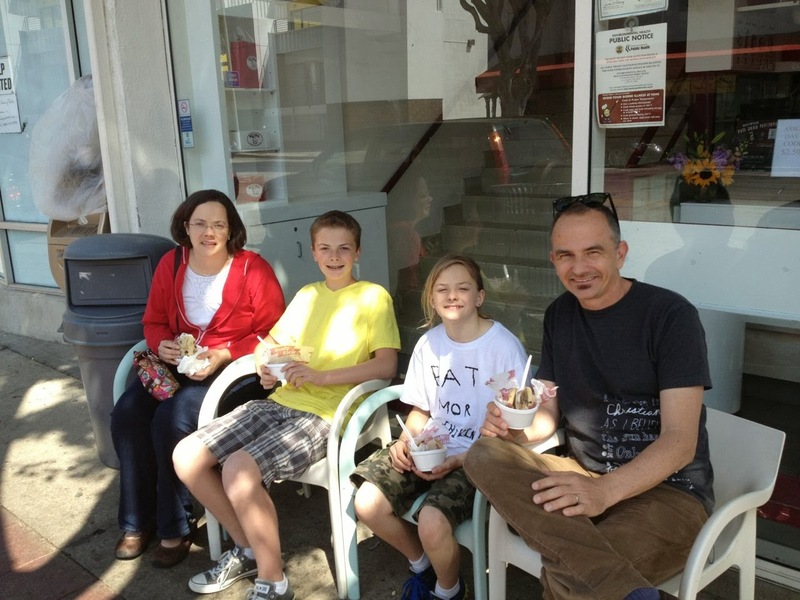 In March 2013 our family was back in Los Angeles for a little three day get-away. Day One we saw the sights in Hollywood, Day Two downtown Los Angeles and the Space Shuttle Endeavor at the California Science Center, and Day Three in the Mid-Wilshire district and the Westside. Here's a link to a list of everything we saw and did. 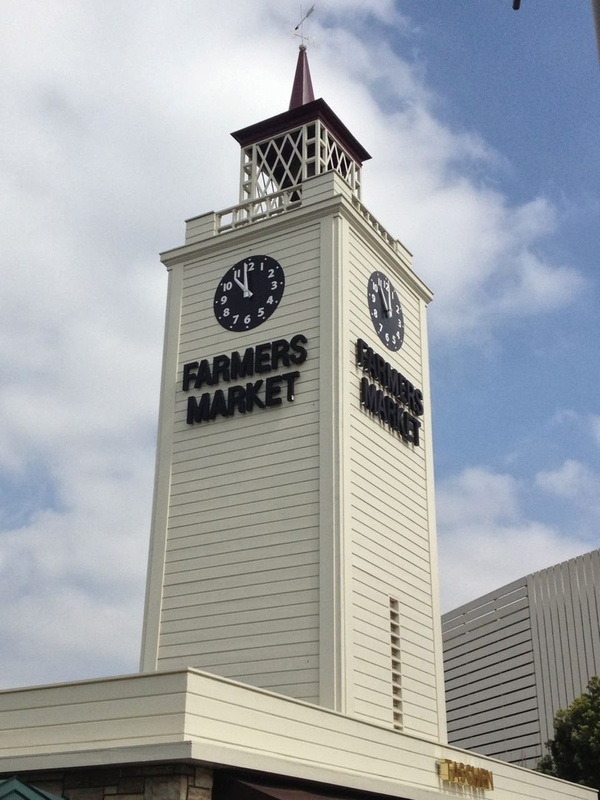 After seeing Levitated Mass, Urban Light, the Wall on Wilshire, and the La Brea Tar Pits, we drove a few blocks over to the Original Farmer's Market, located at 3rd and Fairfax in the Mid-Wilshire district. 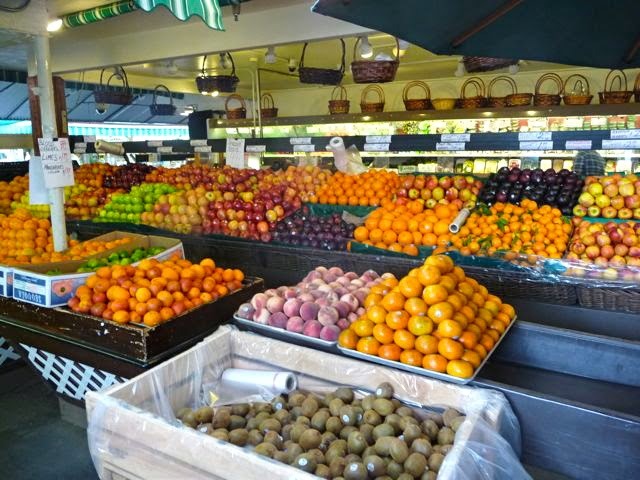 Farmer's Market, also known at "Original Farmer's Market," has been around since 1934 when Los Angeles area farmer's set up a makeshift produce stand on the corner of 3rd and Fairfax. Here's a link to a previous post from 2011 - with a lot more photos and information. 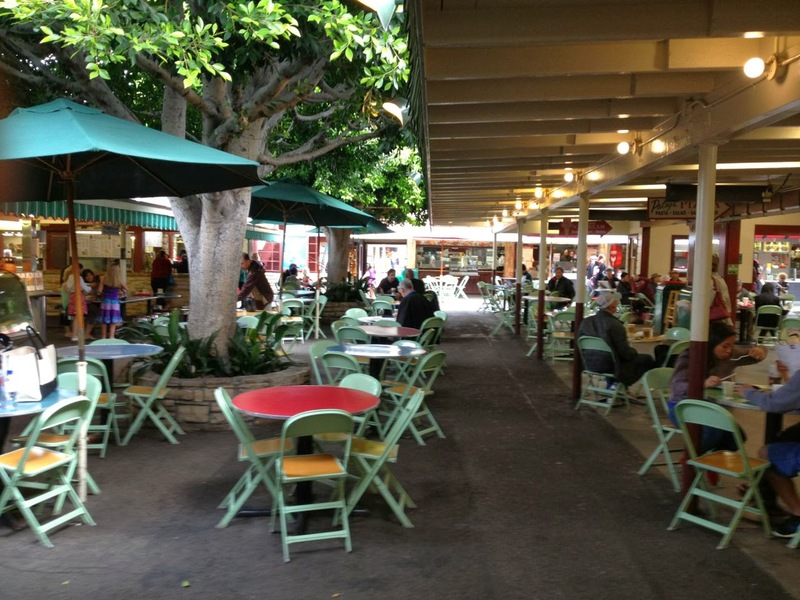 Farmer's Market has a wonderful, nostalgic feel - I have good memories of going here with my grandparents. But we already ate breakfast, and it was too early for lunch. So walked over the The Grove, the much newer outdoor shopping center immediately adjacent. 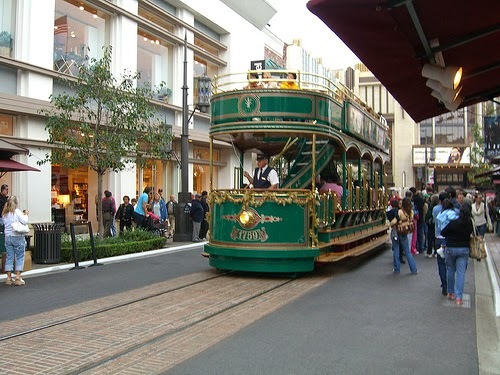 The Grove, which opened in 2002, is a two block outdoor shopping center complete with an animated outdoor fountain (think The Bellagio in Las Vegas, only on a much smaller scale) and a double decker electric trolley - pictured above. It has the usual suspects you'd find at most any outdoor shopping center. 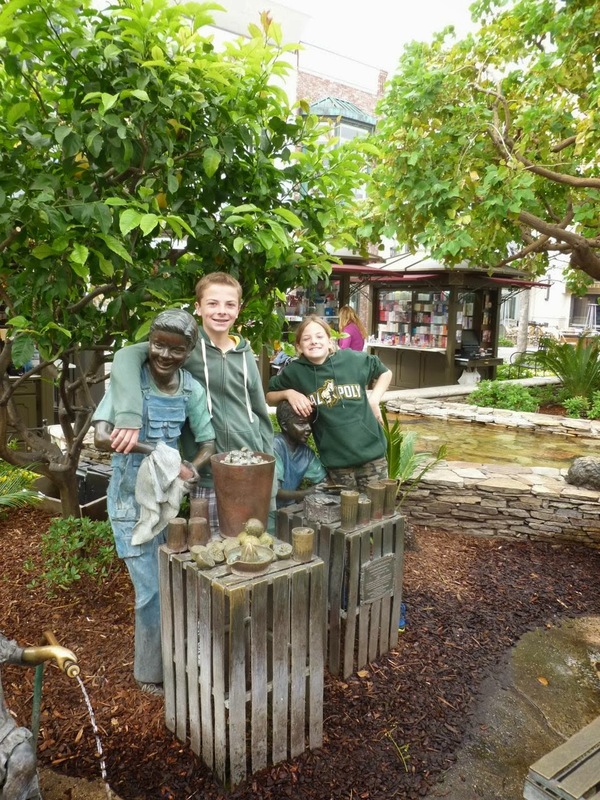 When my kids were younger, they loved the fountain, street car and playing in the little statue water feature (above). For them, this short time was more of a "remember when we use to ...." than seeing something new. The Grove is fine - I'm not a huge fan of outdoor (or indoor) malls. But it's hugely popular, and led to the larger "American at Brand" development in Glendale. 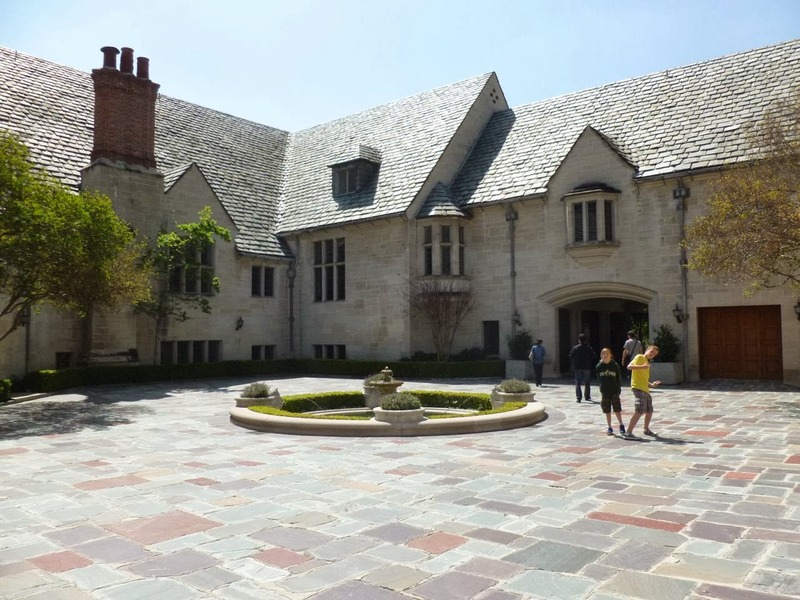 After The Grove, we drove to see the Greystone Mansion in Beverly Hills. I blogged about this last week, which you can read about here. 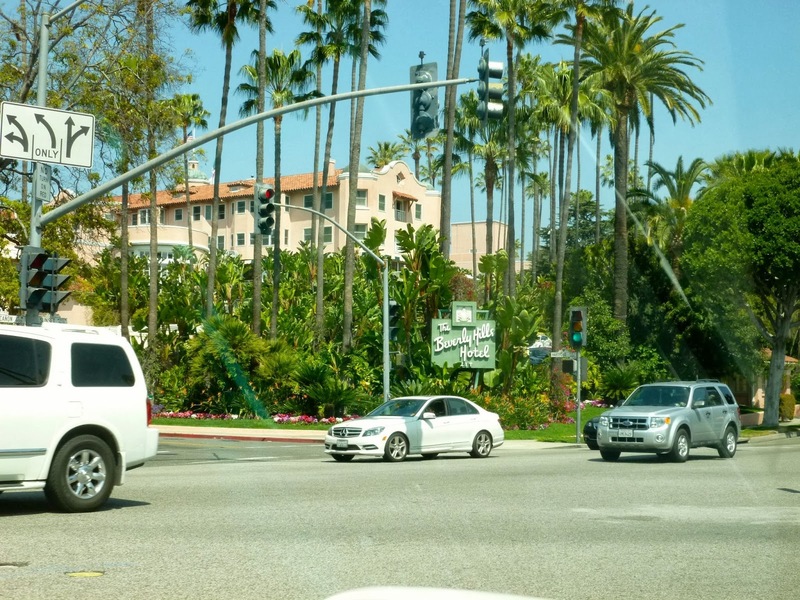 Driving along Sunset Blvd, we passed the historic Beverly Hills Hotel, and I grabbed a quick photo through the windshield. This was in March 2013, before the current controversy (and subsequent boycott) of the hotel. If you want to see the stars home, I'd recommend trying one of many open-top mini vans we saw driving around. This is on Roxbury Drive, which apparently has the highest concentration of movie stars homes in the world. It was interesting - sort of - drive by large homes ... but they were just very nice houses - and we missed was the background story. In many cases, especially with more current celebrities, homes are not even visible from the street. Frankly, who can blame them? By the way, if I was on my own, I think I'd just park and walk around for an hour or two. 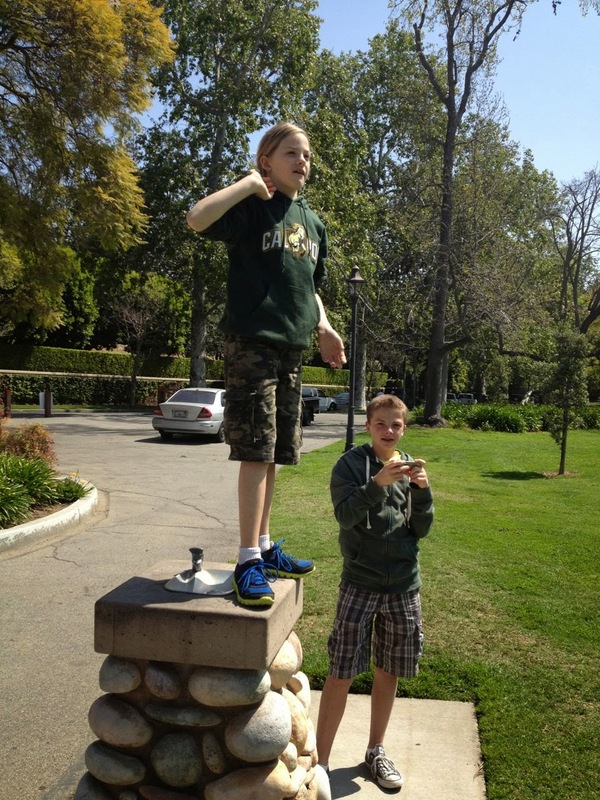 We drove over to Holmby Park, located in Holmby Hills. Holmby Hils is technically located in the city limits of Los Angeles, next to Bel Air and Beverly Hills. This park is only a few blocks away from UCLA, but worlds apart. How does a public park, located across the street from multi-million dollar homes (we're talking $5 million and up - way up) stay "nice?" It's a public park. So anyone can just come over and use it, right? As the local homeowners couldn't simply fence off a city park, they did - for them - the next best thing. 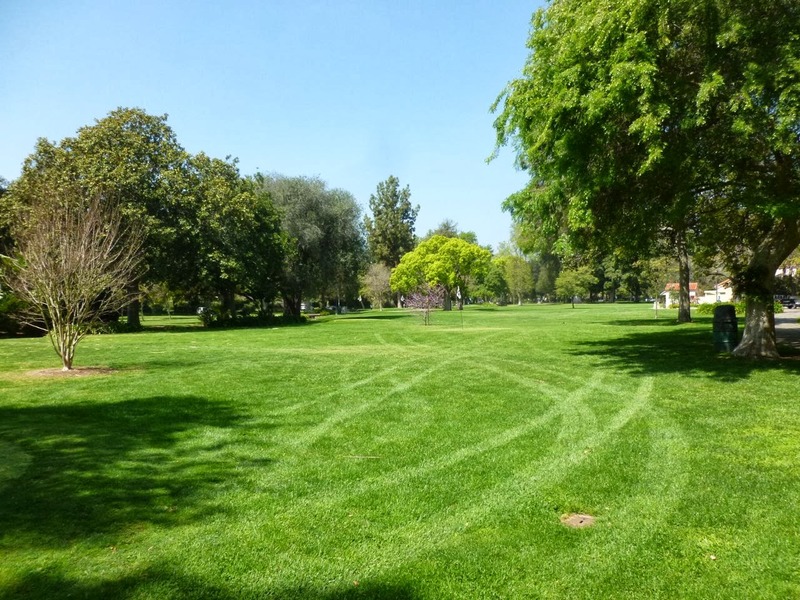 The park is technically a "public golf course." 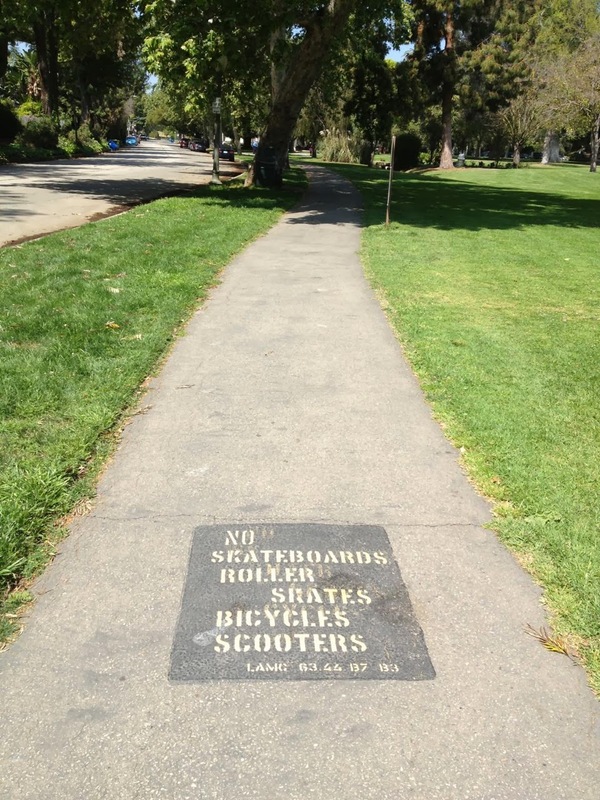 No skateboards, rollerskates, bike, etc. So, if you have a set of golf clubs - come on over. Otherwise - stay out. OK, maybe I'm being a little harsh. Having a small public "pitch and putt" course is amazing. But it'd be nice to have a traditonal park "open to everyone" as well. There actually is a play structure, but my kids thought it was too much for "little kids" - so they just used the water fountain. By the way, immediately behind my kids is the 56,000 square foot Spelling mansion - which is apprently the largest single family resident in Los Angeles. 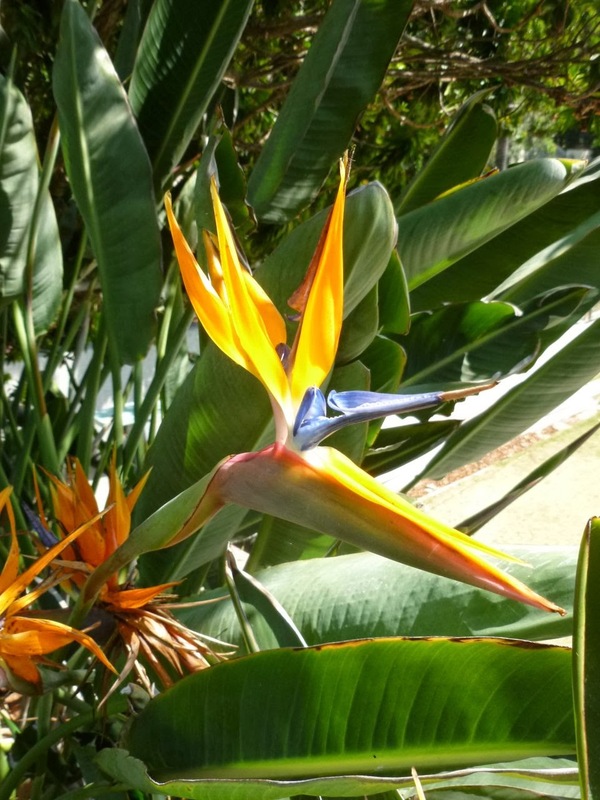 Above, a Bird of Paradise, which is the offical flower of the City of Los Angeles. Here's a link to a previous post with some thoughts this amazing flower. While my kids burned off some steam, I took a few minutes to walk around the park. 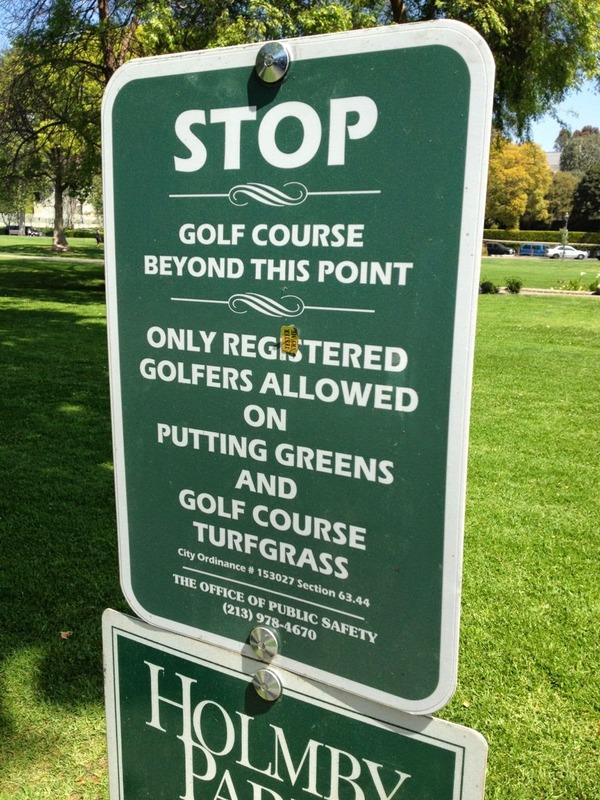 I wasn't playing golf, so I may have been "breaking the rules." Again, if you want to play golf on a pitch and putt, it's great. Otherwise, you'll probably need to look elsewhere. 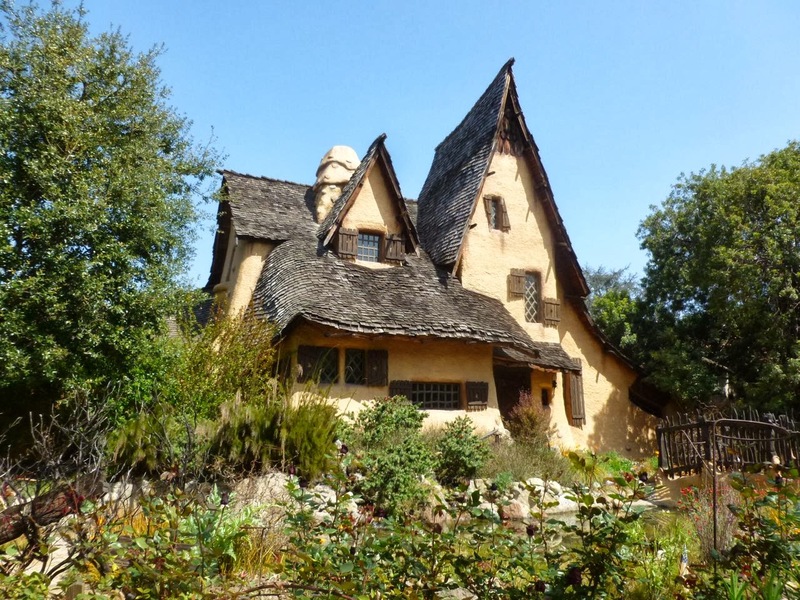 We took a quick detour to see the Spadena House, also knows as the Witch's House, located on the corner of Walden Drive & Carmelita in Beverly Hills. More on this next week. Driving along Wilshire Blvd. 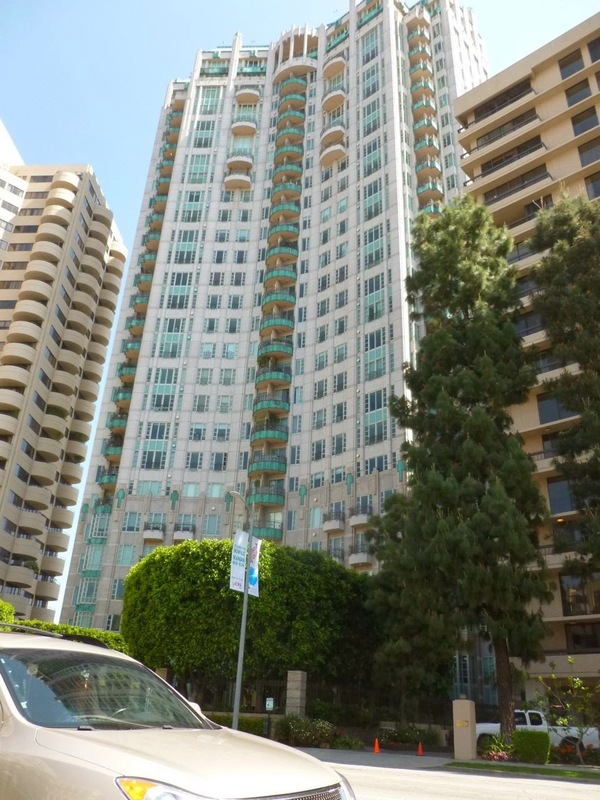 The two miles between Beverly Hills and Westwood Village are often referred to "Condo Canyon" because of the numerous 20 story condo towers along the street. Immediately behind these buildings you'll find very expensive one and two story single family homes. Wilshire Blvd, heading into Westwood Village. My dad's old office building in on the right (the white building with green and gold windows). This is a few blocks from Wilshire & Westwood Blvd - the busiest intersection in Los Angeles. 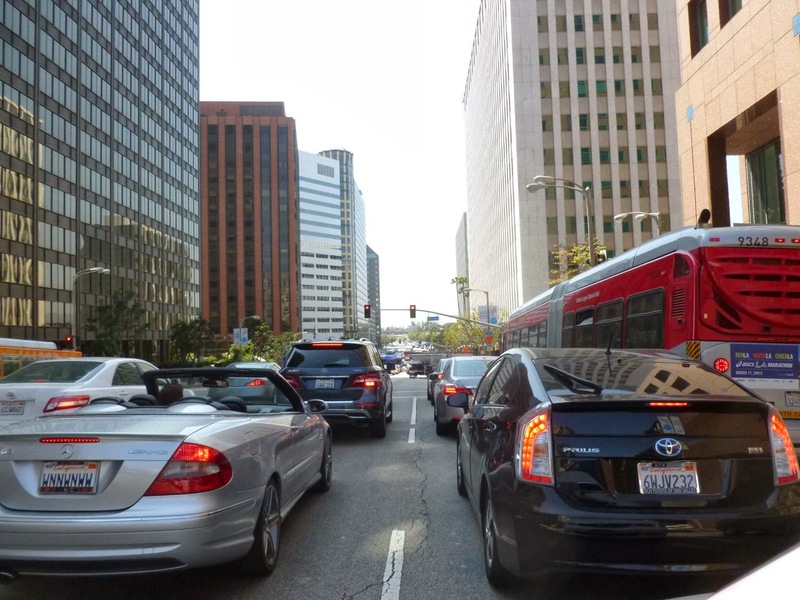 L.A. has the distinction of having the nation's worst traffic congestion. Los Angles has a lot of great things going for it, but traffic is terrible. Think your city is bad? No matter what - Los Angeles is worse. Long term plans call for the Purple Line subway to be extended under Wilshire all the way from Koreatown to Westwood Village. Awesome plan, but it's not expected to be completed for another twenty years - sometime around 2035! 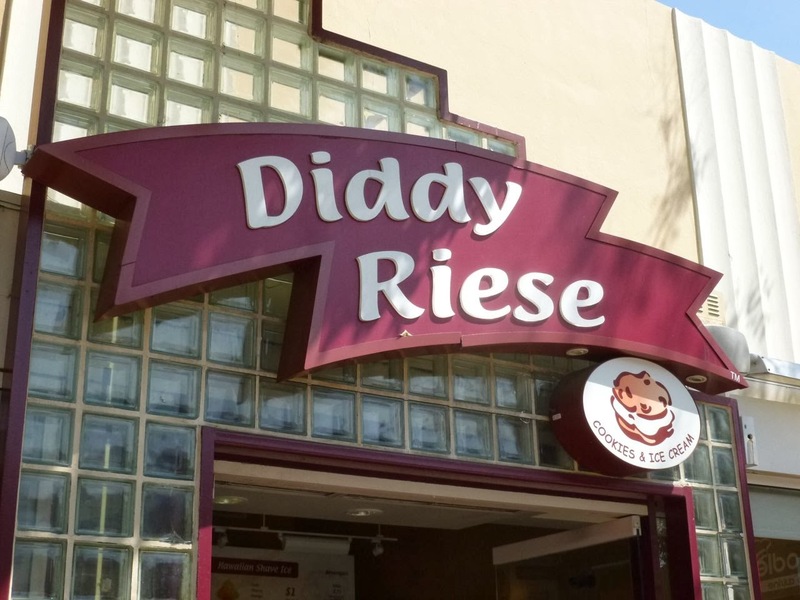 Diddy Riese, Westwood Village. There is two hours free parking during the day at the Broxton Avenue Parking Garage. If you're driving - I highly recommend it! Watch the signs, because after 2 hours, the prices REALLY go up. If you park after 6pm, it's just a flat rate of $3 - which for Westwood is an incredible bargin. 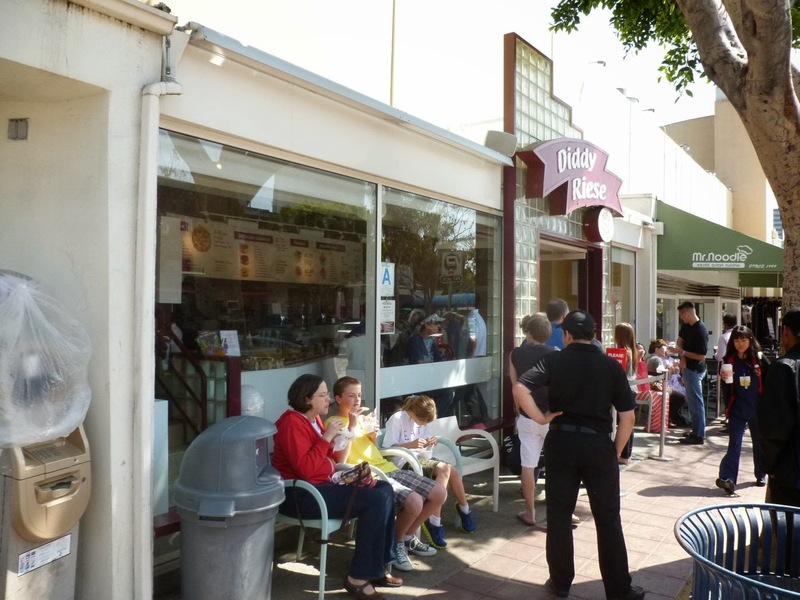 Diddy Riese is located less than a block from UCLA - and almost always has a line. They feature awesome ice-cream sandwiches for just $1.75. Less than half what you'd pay anyplace else. When they opened back in 1983, the ice cream sandwiches were just $1.00 - and an immediate hit. I checked an on-line inflation calculator. $1.00 in 1983 would be $2.37 today. So, so adjusted for inflation, their ice cream sandwiches are even a better deal than there were when they first opened! Seating is very limited - we were able to score some of the few chairs out front. 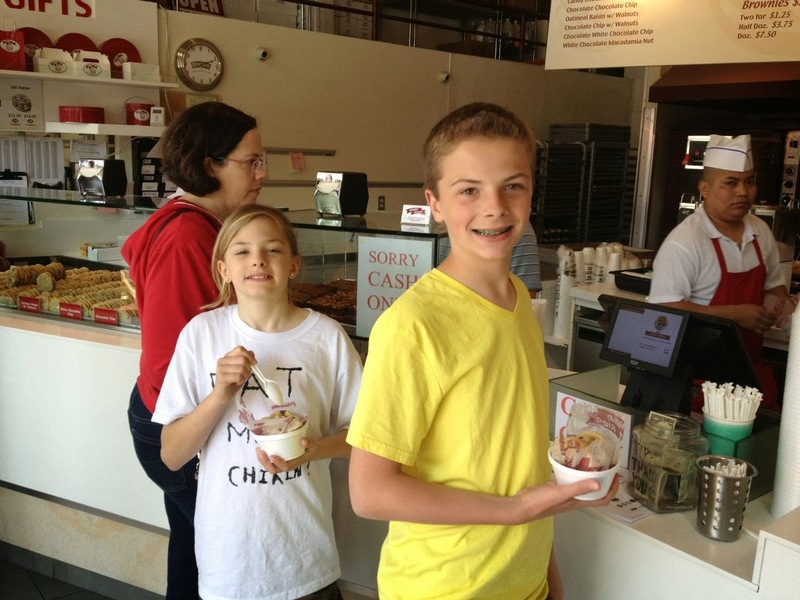 I know people who've driven up from Orange County (50 miles south) to do to Diddy Riese. Personally, I think that's crazy - but it shows what a loyal following it has. But if you're in the area, I would say stop off any enjoy what has to be the best ice sandwich (certainly the best value) in Los Angeles. More on the Spadena House next week, and finishing up with the Skirball Center after that.